Franz and Sandy Imlig on their Springfield Orchard at Lower Kaimai. Photo: Bay of Plenty Ballance Farm Environment Awards. Franz and Sandy Imlig had a full-time electrical business in Galatea and two young children in 1996. Their accountant encouraged them to invest, so they purchased 14ha in Lower Kaimai – close to 500ft above sea level – with a plan to “do something with it, sell it, and make money”. 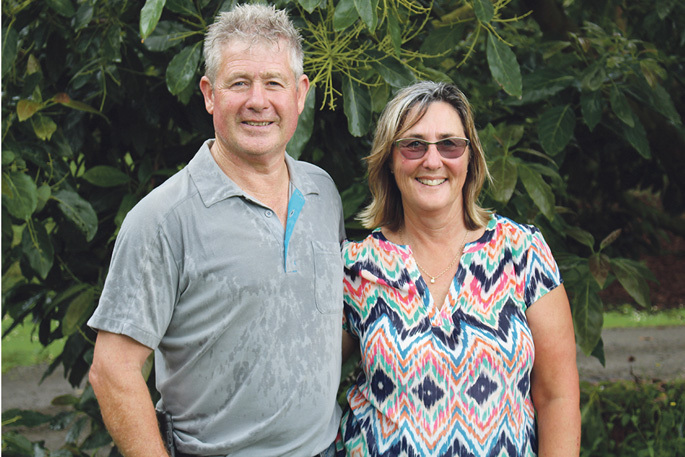 “But we fell in love with the property and the challenge,” says the couple, who have established a consistently-producing avocado orchard while considering their footprint on the environment, and have been named finalists in 2019’s Bay of Plenty Ballance Farm Environment Awards. At purchase the Imlig’s children were aged four and six. “We put a caravan on and travelled every second weekend for 15 years working on the property as much as we could,” says Sandy. They started planting avocados in 1998, about 200 each year. When they got 1100 trees they undertook a thinning process. Today Springfield Orchard has 4.5ha of avocados, with 480 mature trees and 200 young trees planted two years ago. Some may question the land’s altitude, and while Franz says they don’t produce as much as lower orchards in Bethlehem, Te Puna and Katikati – since moving to the property four years ago they’ve managed to produce consistent crops. “We have our regime of doing things, which can be quite different to what others do,” says Franz, who says they’re in the upper percentile of growers for production. But it’s not all about production. Since living onsite the Imligs say they’ve had more time to focus on the operation and become more environmentally-conscious. Franz says the altitude brings a lot of rain “so we use a minimum amount of hard fertilisers”. “We did start by using a fert spreader but found we were using a lot of fert where we didn’t need it. We fertilise by hand; this cuts our fertiliser usage and allow us to give more to trees that need it. And Franz’s electrical skills have come in handy to limit their water use. The Imligs have an unconsented bore under BOPRC’s Rule 38: Permitted Take and Use of Groundwater up to 35m3/day per property. “We supply five houses, which can draw what they like, and we’re allowed 35m3 in a 24-hour period. For irrigation Franz says they use tensiometers to measure ground dryness and how hard the tree is working to pull moisture. While this saves water, Franz says it also gives each block the right amount of water it needs, and reduces electrical costs in pumping unnecessary water around the property. In Galatea Franz was a pumping and irrigation specialist. He has installed a variable speed controller on the irrigation system “so if the system doesn’t need the full power to draw the water, it doesn’t use it”. Sandy says they use soft sprays wherever possible, even though they’re more expensive “because we have wild bees here all the time and we are a bee stud for our apiarist”. In fact, they’ve been part of a number of trials – both to improve their own orchard practices and find ways forward for their industry. A large trial with Farmlands has looked at how much water they need to put chemicals on. “For this, generally when spraying avocados 2.500L per ha is used to get enough coverage. “It’s actually working better than our standard way of spraying, so we’re conserving water in our spraying practices. We used to spray 5.5 tanks; now we spray 4.5 tanks. Another trial underway is using a different product to lessen use of copper on-orchards. “I think the reason we do these trials is we can see that this is our livelihood, our industry and if someone doesn’t put their hands up to do these trials, we’re not going to get anywhere,” says Sandy. Last year they were also a trialist orchards to supply the new China market. The Imligs say they love birdlife, have their own aviary and love planting trees to attract birdlife. And this has prompted their passion to restore a BOPRC-listed reserve on the property with native fauna. So after spending years killing huge old man pines and pulling out Taiwan cherry, wild kiwifruit and avocados, they’ll replant the gully in 200-plus native pigeonwood, kanuka, and Miro this autumn. As for Springfield Orchard – named after Franz’s father’s farm in Galatea – an effective pruning regime, use of a growth regulator product called Sunny, and treating every tree and its health individually is what the couple credit for enabling their consistency of production every year. “But we’re still achieving our goals in a really environmentally-effective way. Because the environment is everything to us,” says the couple. Franz says ensuring their operations become more sustainable hasn’t been very difficult. “It just takes a little bit of thought and ideas and putting them into practices.